Music in the heart and soul can be heard by the universe. Learn how to listen and play your heart's song with Luba as you guide. Luba Brodsky-Benefiel , piano and theory teacher, began Love for Music Studio to serve an ever-growing student need for excellent teachers. Her Russian style and training are known for its high quality and superior results. 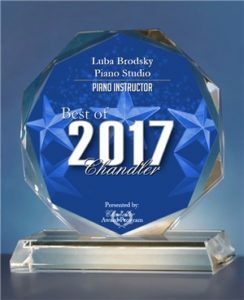 Luba Brodsky-Benefiel graduated from the Mussorgsky College of Music in St. Petersburg, Russia, with a major in Piano Pedagogy and Performance. She studied at Kneisel Hall in Maine with Seymour Lipkin. Shortly after arriving in the United States, sought after by ASU patrons, Luba became accompanist for the Arizona State University Departments of Dance and Choral Music. She also accompanied and recorded for Ballet Arizona and West Valley Symphony. Ms. Brodsky-Benefiel accompanied for the Department of Dance at the University of California Irvine. While there, she performed with such entertainers as Patrick Swayze, Irena Kolpakova, and Mikhail Barishnikov. Her professional resume speaks to her expertise with the instrument. Ms. Brodsky-Benefiel is also a featured accompanist for the annual Arizona Vivaldi Festival held at Arcosanti in Mayer, Arizona. She currently teaches privately at Music Masters in Scottsdale, Arizona and at her studio in Chandler, Arizona. 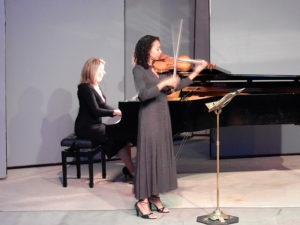 Her students perform in annual recitals and participate in performance and theory exams sponsored by the Phoenix Music Teachers Association. *Additional fees for Arizona Music Association annual test. Fees include assessment of student, development and delivery of individual study plans. ** 2019 - 5 wk months - March, May, August, November. My schedule is nearly full. Contact me directly. I'm thankful for the recognition I recently received and the beautiful award. It is an honor to be recognized for the work that I so love to do. Due to my student load increasing I can no longer drive to student homes. New students will need to come to my home studio. I can serve more students effectively that way. I you would like to leave a review, that would be really nice. Please click here. Affordable websites and social media help for small businesses. Discounts to teachers with referrals from Luba.